Minister of National Defense Rodrigo Hinzpeter arrived Friday in the Bío region, where he witnessed the first test flight of the Unmanned Aircraft System developed by the Chilean Army, a prototype called "Lascar", which has been under development since 2008 and is now in testing phase. The "Lascar" prototype was developed by the Army in collaboration with the University of Concepción and Private Enterprise. Among its many uses, the Minister emphasized monitoring of water sources, of volcanoes, natural disasters as well as rescue operations, fire monitoring and fisheries surveillance. 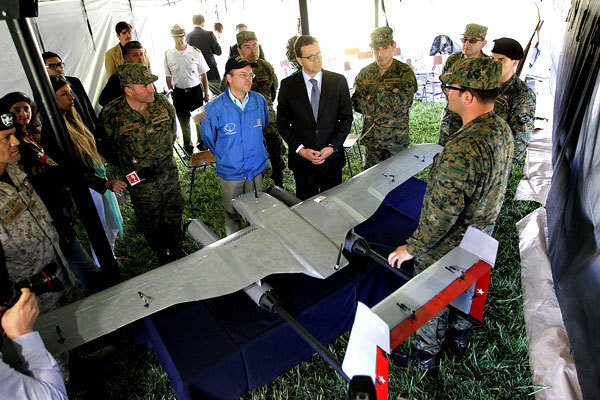 "It gives us a lot of pride and satisfaction to all see how the Army, our Army of Chile, in conjunction with the University of Concepción, a magnificent and traditional institution of this region, and the private sector come together to develop an unmanned aircraft that will allow us to do so much in a country with so many challenges in terms of natural disasters, "said Minister Rodrigo Hinzpeter at the end of the activity. The minister added that the joint development of this prototype "demonstrates that in Chile there is intelligence, capacity for innovation, there are capabilities to enterprises of this nature, we sometimes think they are equity or monopoly only highly developed countries." In addition, during his visit to the Biobío region, the minister also visited the Reinforced Regiment No. 7 Chacabuco, the Talcahuano Naval Base, Grumetes School Quiriquina Island and Asmar.